The H-Unit at San Quentin State Prison just north of San Francisco houses inmates serving sentences under 15 years. Enclosed in a far corner of the barren blacktop expanse sit four raised beds of greens, herbs and ornamental plants. At this green oasis, men enrolled in the Insight Garden Program (IGP) are offered the opportunity to re-envision their lives as fertile ground. Here, inmates dig the soil, plant seeds, pull weeds and spread mulch. Along with this vocational training, they’re also introduced to holistic practices like mindfulness meditation and systems thinking. This unique approach helps inmates connect to self, nature and community, providing a foundation for a healthier life while in prison and after release. Over the past 12 years, this class—which meets just once a week—has had an oversize impact on its 1000 participants. Surprisingly, the program’s benefits have little to do with eating what is grown here, since every vegetable and herb is donated to local nonprofits. Rather, through taking responsibility for planting, tending and harvesting the garden, prisoners learn to take responsibility for their own lives. IGP Director Beth Waitkus explains that facilitating an understanding of gardening and eco-principles opens the men to insight and a deeper understanding of interdependence. “The guys in the program have so many Aha! moments when they learn how growing food and creating gardens can be a solution for healing many systems: social systems, food systems and environmental systems,” she says. But these outer-world issues mirror important inner issues, which are addressed through IGP’s inclusion of mindfulness practices. “They start to cultivate strategies for living as they begin to see their lives as a garden that they can tend,” she says. Skye, a ponytailed man in his late thirties, clearly articulates the connection: “The gardening metaphor is using the example of nature to correct misguided principles that we have entertained as misguided men. So for example, we have things like weeding that we do regularly, right? But we didn’t do that in our own personal lives, a lot of us—and weeding is essential. Charles, an older African American man, calls himself a “repeater” because he’s served multiple sentences. He had worked as a landscape designer before he spent time in prison, so the garden is a familiar spot for him. But his previous training only went so far. It’s IGP’s ability to connect gardening with inner change that has been the most helpful for him. “Plants need the same care and attention that we need to give ourselves and each other,” he says. Other lessons are more subtle but just as powerful. Peace, beauty and even freedom seem to grow through the gardening program. “There’s such a quietness here where you can hear your thoughts,” says Charles. Azraal, whose towering figure has earned him the nickname “Big Az,” also appreciates the tranquility and the freedom he finds in the garden. “When I was transferred to this unit, I was drawn to the garden,” he says. Azraal admitted that he hadn’t touched a tree in 12 years up to that point; his connection to nature had been completely severed while serving time, until he joined the Insight Garden Program. Waitkus began developing ideas for IGP after the attacks of September 11, 2001, when she, like many others, began reassessing her life. “I had been working as a communications and organizational consultant,” she explains. “But was this really the legacy I wanted to leave to the world?” A series of introductions took her to San Quentin, located just miles from her house in Marin County, where she was inspired by Jacques Verduin, founder of the Insight Prison Project, who was bringing his own mindfulness-based programming to the prison. She thought she might be able to add to Verduin’s efforts by creating a green space for inmates. 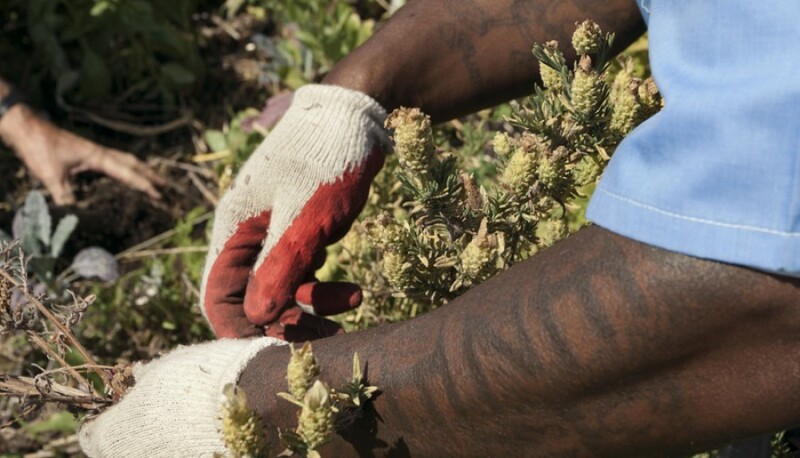 As a lifelong gardener, Waitkus was deeply impacted by the desolate and depressing physical environment at San Quentin and had the hope that she could “grow gardens to heal lives.” She knew that many institutions, from hospitals and rehabilitation centers to retirement homes, used gardening—or, horticultural therapy—to help with the physical and mental health of residents.1 In 2003, Waitkus broke ground on a garden plot in San Quentin with the help of a committed group of prisoners. Despite so much land and labor available at prisons, gardens are extremely rare, and difficult to establish. 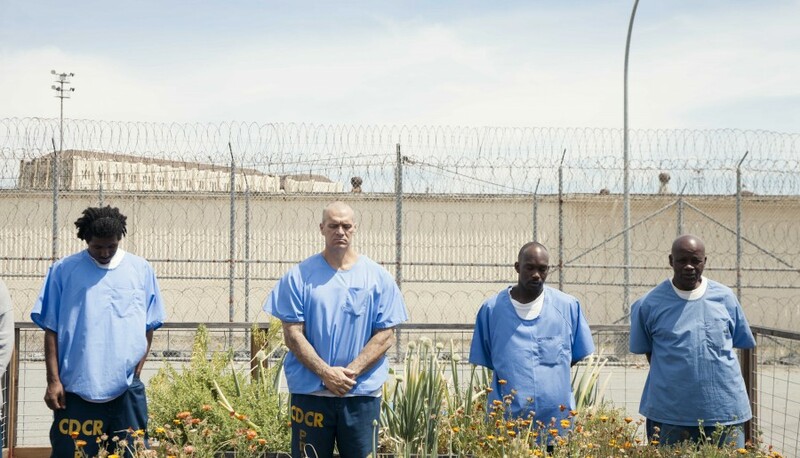 It had taken Waitkus a full year to gain permissions from San Quentin to create a small flower garden, assemble a team of volunteers, design a garden curriculum, and create the organization. Permissions for a second, larger garden took five years to secure. Waitkus calls the process “an enormous struggle” that involved multiple stakeholders coming together against the odds. Too many individuals from our country’s prisons are released without the skills or connections to find jobs, housing and community. They default to their previous criminal behavior until something breaks their cycle of crime and incarceration. The Insight Garden Program, with its combination of mindfulness and vocational training, offers both personal transformation and a path for successful reentry. Exposure to nature is crucial for human development, and also for building up the capacity for empathy. How can gardening prove to be so effective for furthering rehabilitation? Studies in biophilia, which hypothesizes an innate and meaningful connection between human beings and nature, are showing that exposure to nature is crucial for human development, and also for building up the capacity for empathy.5 Horticultural therapy is a well-documented path to reduce stress and anxiety and promote both physical healing and psychological well-being. The garden’s benefits to well-being are intuitive, but how does the IGP contribute to reduced recidivism? Planning and taking care of a garden has been shown to improve cognitive functioning—to the degree of even reducing the risk of dementia in older individuals. Some of the tasks associated with gardening—such as planning the garden, planting the seeds, caring for the soil—can stimulate the area of the brain responsible for executive functioning. Through gardening, inmates can improve their capacity for planning and problem solving, assessing consequences of one’s actions, regulating emotions and increasing self-control. Over four semesters, the program follows a curriculum aligned with the seasons. In the winter, the men study systems thinking and ecological principles, learn how food is produced and consumed in today’s economy, and study food systems’ impact on climate change. In the spring, they tackle more specifics about gardening and plant biology, and build their vocational skills with mulching, pruning, planting, weeding and watering. Summer is their season for cultivating their own “inner gardens” and building up emotional intelligence through basic meditation and mindfulness training. One practice session, for example, includes reading a poem with vivid images of nature followed by guided meditation that helps inmates turn from personal thoughts and concerns to peaceful and nurturing impressions of sunlight, flowers, cool grass and other natural elements. “Cultivating mindfulness is like cultivating a garden," says Waitkus. Together, these program elements help inmates relate their work in the garden with life beyond their own immediate needs. Reginald, an IGP participant, said he’d never studied ecology before and it was a revelation to realize that he was in a reciprocal, cooperative exchange with the environment. “[Plants] give me oxygen, and I give them carbon dioxide. We need each other,” he explains. Caring for the garden during a record drought in California has also given him a newfound appreciation for water. The men have devised a system for capturing greywater from the sinks in the chow hall to use on the garden, which saves gallons and gallons of freshwater. “Nothing’s wasted in nature,” Reginald explains. One material just transforms into another, and the cycle goes on. 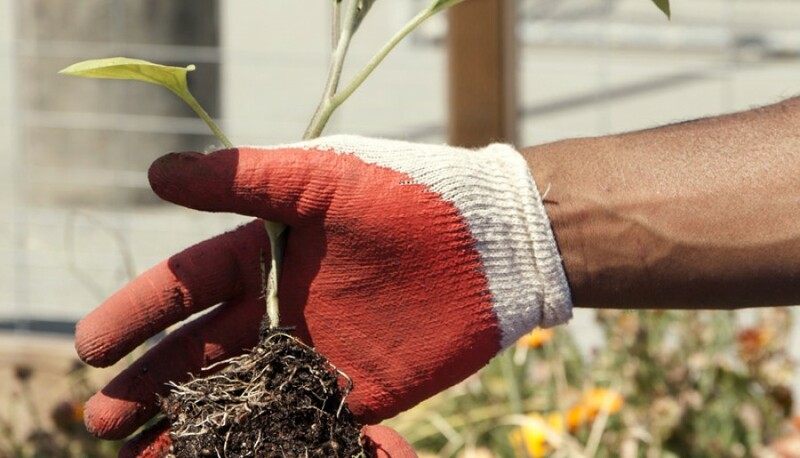 Unlike many prison-based rehabilitation programs, the Insight Garden Program connects inmates with job opportunities upon release. IGP began partnering with Planting Justice, a nonprofit food justice organization based in Oakland, in 2008. Planting Justice staff work with the inmates in the garden, teaching them skills and reinforcing the objectives of the curriculum. Then they train and employ IGP graduates to build edible permaculture gardens for $17.50/hour in the Bay Area once they are released. “Planting Justice is a direct pathway to living wage jobs,” says Gavin Raders, Executive Director. The organization has placed 17 men in jobs and also teams up with five other community organizations to provide connections to housing and social services. “You not only need a job when you get out,” he explains; “when you have a lack of social services, that directly contributes to high recidivism rates and violence.” So far, Planting Justice has not seen a single employee return to prison. Waitkus says that she has had interest from many other prisons across the country that want to set up garden programs. She began working at the California State Prison in Solano in 2013. Her program, which received a grant to support a small core staff, has also recently received funding from the California Department of Corrections and Rehabilitation to expand to two additional state prisons. On top of these four California facilities, Waitkus and her team are launching the curriculum in Indiana and New York state. The garden class begins with a guided meditation. Vegetables and herbs are planted and harvested seasonally and are donated to local food kitchens. Beth Waitkus (center) with a volunteer from Planting Justice (left) and a participant in the Insight Garden Project at San Quentin. THE IGP CURRICULUM TEACHES VOCATIONAL SKILLS LIKE MULCHING, PRUNING, PLANTING, WEEDING AND WATERING. Trowels, pruners and gloves are "counted out" before anyone leaves the garden. 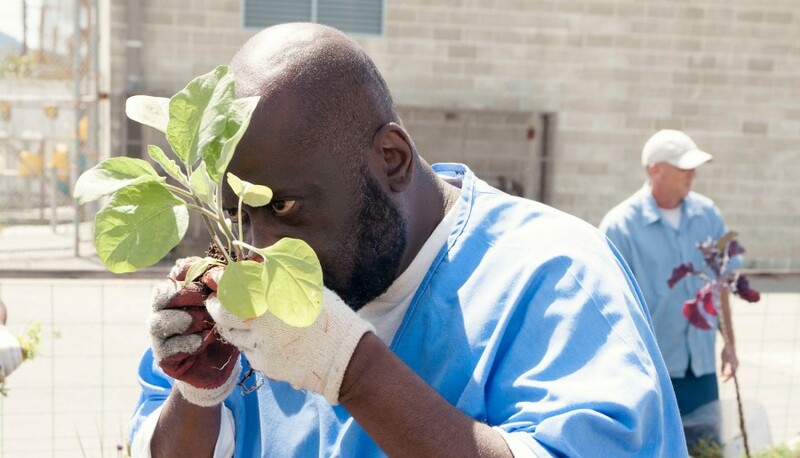 While inmates can plant, care for, and harvest herbs and vegetables, prison regulations prohibit eating from the garden. “There’s such a quietness here where you can hear your thoughts," says Charles. Growing Gardens (2015). Horticulture Therapy Program. Waitkus, B. (August, 2004) The Impact of a garden on the physical environment and social climate of a prison yard at San Quentin State Prison. Allen, D., Babby, W., Beard, J., Beyer, B., Grassel, K., Maxwell, D.,Nakao, M.,Toche, D., (2014, January). California Department of Corrections And Rehabilitation 2013 Outcome Evaluation Report. Van Der Linden, S., (2015). Editorial Green prison programmes, recidivism and mental health: A primer, Criminal Behaviour and Mental Health. Berito, R. (2014, December). The Role of Nature in Coping with Psycho-Physiological Stress: A Literature Review on Restorativeness. Cruz, A., Hoffman, A., Thompson, D., (Spring, 20014). Gardening, Self-Efficacy and Self-Esteem. Community College Enterprise, Vol. 10, No. 1. Using community as a container for transformation, the Guiding Rage into Power Program leads prisoners through their pain toward a sense of belonging and commitment to service. Writing, dance, and theatrical performance become opportunities for self-discovery, social skill building and ultimately rehabilitation through RTA’s innovative inmate programming. The Mind Body Awareness Project brings mindfulness practices to vulnerable youth, helping them develop the empathy, self-awareness, and self-regulation needed for healthy adulthood. ArtSpring’s creative arts programming uses emotional awareness to transform women’s patterns of isolation and victimization into personal power and community leadership. Bringing social-emotional learning techniques to inmates and prison administrators alike, the Prison Mindfulness Institute helps break both individual and systemic cycles of incarceration. 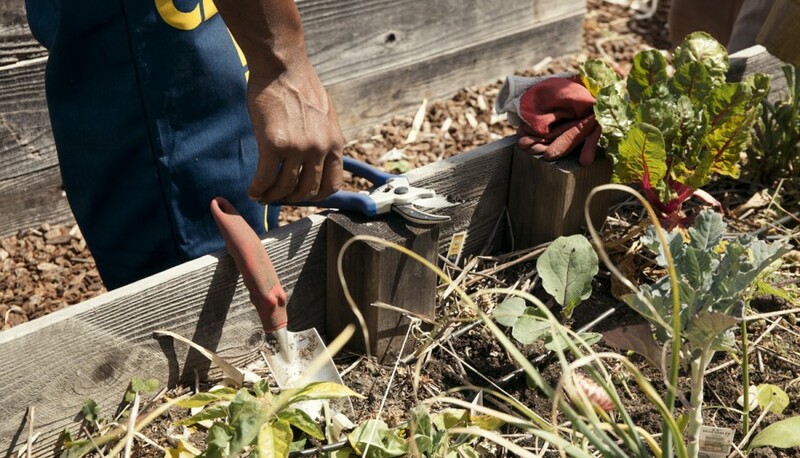 Through the basics of tending gardens, the Insight Garden Program teaches inmates to care for themselves within life’s interdependent systems while training them for future work. Authentic communication is the context for empowerment with the Center for Council Program, which uses the profound experience of sharing stories and being heard to support rehabilitation.